The Big Island of Hawaii is the most variegated among all the Hawaiian islands. Hawaii has active volcanoes, lush rainforests, vast lava-fields, and stunning beaches. Not just your regular white sand beaches, Hawaii has black and even green sand beaches. While some of these unique places are easily accessible, a few of them require some hiking. Here’s my list of the best hikes on the Big Island Hawaii. The Big Island of Hawaii or just Hawaii (as the locals like to call) is the largest island among the chain of eight main islands that comprise the state of Hawaii. Because of its active volcanoes Big Island Hawaii is still growing. You can see this especially when driving the ‘Chain of Craters’ road in Hawaii Volcanoes national park. Thruston lava tube is located on the Crater Rim drive in Hawaii Volcanoes national park. This hike is a walk in the park, literally. You stroll through a beautiful rainforest on a well-maintained path and then pass through a 600 foot well lit cave. 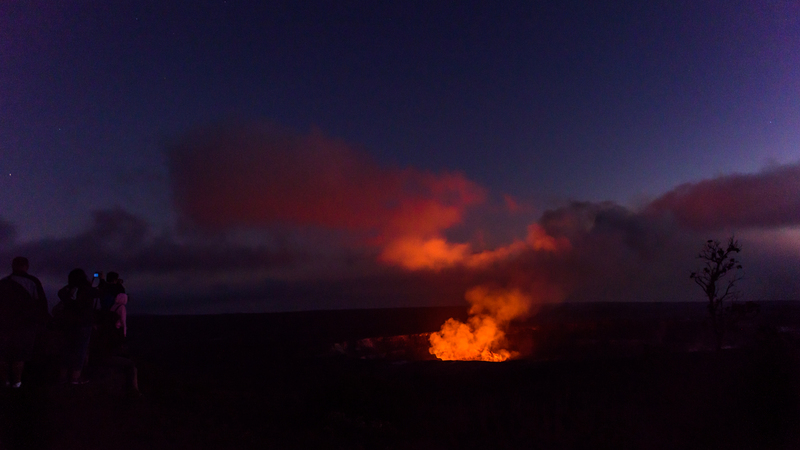 The lava tube and Kilauea Iki trail share the same parking lot, hence spots can fill up soon. Update: After the May 2018 volcano activity, Thruston lava tube is closed. Please visit this link to get latest updates from the park. A local secret, Makalawena beach is off the beaten path and a mile hike from another stunningwhite sand beach. Makalawena beach is part of Kekaha Kai state park, formerly known as Kona Coast state park and lies to the north of the town Kailua-Kona. 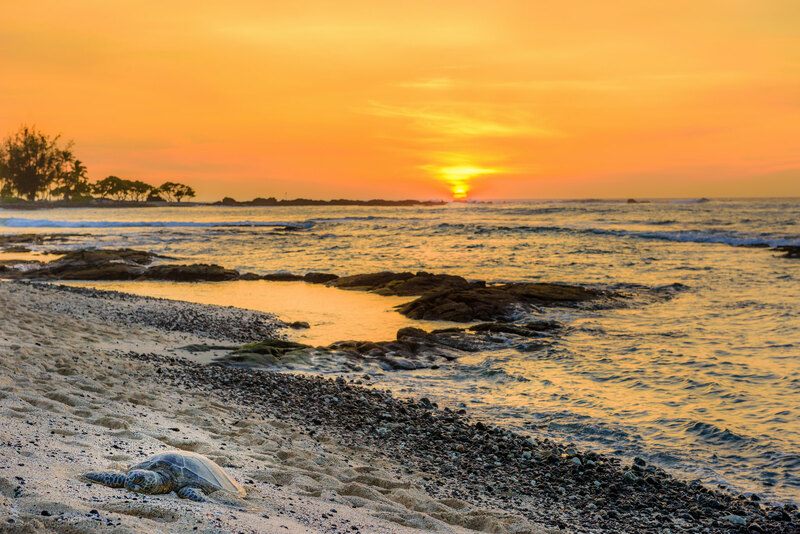 This state park includes three beaches – Mahaiʻula Beach, Makalawena Beach, and Maniniʻowali Bay(Kua Bay). And let me tell you, all these three beaches are absolutely beautiful. However, Kekaha Kai state park is undeveloped and not very easy to get to. Part of the road is unpaved, but it is still ok for a 2WD (that’s what we drove). To reach Makalawena beach there are trails from the north as well as the south. We used the trail from the south to get to this white sand beach. We drove Highway 19 north of Kona International Airport. Between mile markers 90 and 91 there is a dirt road that leads to Mahai’ula Bay. At the end of the dirt road is a parking lot with portable toilets and picnic tables. If you need to answer nature’s calls, this is the place. There are no restrooms at Makalawena beach. From the parking lot you need to walk past Mahai’ula beach towards the north end and take the trail through a barren lava field. After a 20-30 minute walk you will reach white sand dunes covered with green creepers. A short walk through these dunes and you will get your first views of Makalawena beach— a lovely crescent shaped white sand beach. Makalawena beach has no shade, no toilet, no drinking water, and no lifeguard. Bring a beach umbrella, beach mat, portable water, sunscreen, and snacks. You will definitely want to spend sometime at this fine beach. I would also recommend to wear proper shoes (not flip-flops) for this hike as most of the walking is through sharp and rocky lava fields. Green sand beach, bright blue ocean, and a dark patterned outcrop — Papakolea beach is a stunningly beautiful place. Also, it is a very special place as Papakolea is one of the only four green sand beaches in the world. Without going into the details of how this place was formed, which you can read here , I have penned down some important pointers about the hike. Papakolea beach is in Ka’u district (south), around 3 miles east of Ka Lae or South Point, which is the southernmost tip of the United States. This beach is surrounded by pasturelands and is legally accessible only by foot. From the parking lot walk towards the ocean, and then take the road to the left. Keep walking along the coast with the ocean always on your right hand side. After about 2.5 miles you will reach a cliff with the first views of the green sand beach. In my opinion the climb down this cliff is the only difficult part in this hike. The most important point – driving to Papakolea beach is illegal. You will be greeted by friendly locals at the parking lot offering a ride to the beach for a nominal fee. Kindly refuse any rides nor drive your rental vehicle to the beach. Driving to the beach cause significant ecological damage to the area; so DHHL (Department of Hawaiiiian Home Lands) has strictly restricted vehicular traffic here. Because of these illegal vehicular tresspassing, DHHL has plans to close down the area or start a fee structure. Read more about it here. Papakolea beach has little or no shade, no toilets, or water facilities. It is a good idea to start this hike early in the morning to avoid the scorching afternoon heat. Carry enough drinking water and pack a picnic from the nearest town of Ocean View (if you are driving down from the west). There is also a good coffee place on South Point road called ‘Ka Lae coffee’. This is the best place to stop for a cuppa and use the restroom. And lastly, please do not take any sand from the beach. Not only is it against the law, but you don’t want this beach to turn into a ‘regular’ beach. Imagine the state if every other person thinks it’s ok to take a handful of green sand back home! Pololo valley hike (~1 mile round-trip) This hike starts at the Pololū valley lookout on the north Kohala coast. It’s a short hike with dramatic coastline views and a black sand beach (Pololū beach) at the valley floor. Kīlauea Iki trail (~4 miles round-trip) This popular trail lies in Hawaii Volcanoes national park. The trail begins near Thruston lava tube and takes you through a lush rainforest. On this trail you will see steam and sulfur vents and even walk on a solidified lava lake. Alas, this hike cannot be done with kids, so we skipped it. Kīlauea Iki hike is not recommended for pregnant women and people with respiratory problems. Before venturing out on any hikes in Hawaii Volcanoes national park it is best to check the VOG levels online, or talk to a ranger at the visitor center. Park rangers have current VOG conditions and they will suggest hikes if you have a child with you, or if you are pregnant, or have any respiratory conditions. Carry out all your trash and remember to leave every place a little better than you found it. Aloha and Mahalo. Is Maui on your mind? Click here to plan your Maui trip. For more breathtaking pictures from Hawaii, hover on the picture below and click on the arrow.